The following are excerpts from the latest NAB RESIDENTIAL PROPERTY SURVEY, reflecting Q4-2017…. Market sentiment & confidence steady but dynamics shifting from eastern states to SA/NT and WA. FHBs emerging as key players in housing markets as foreign buyers shrink. 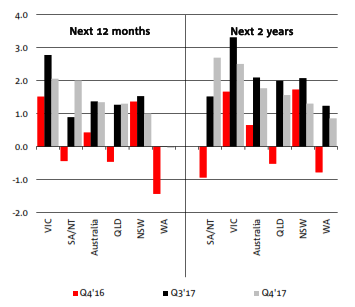 National housing market sentiment (measured by the NAB Residential Property Index) was unchanged in Q4, as big gains in SA/NT and WA (but still negative) offset easing sentiment in the key Eastern states (NSW and VIC). Confidence levels also turned down, led by NSW and VIC, but SA/NT a big improver. SA/NT is now also the only state expected to record faster house price growth over the next 1-2 years, but prices are expected to grow fastest in QLD and fall in NSW. Income yields should however improve over the next 1-2 years as rental expectations exceed house prices in most states except QLD and WA. First home buyers (especially those buying for owner occupation) continue raising their profile in new and established housing markets, with their share of demand reaching new survey highs. 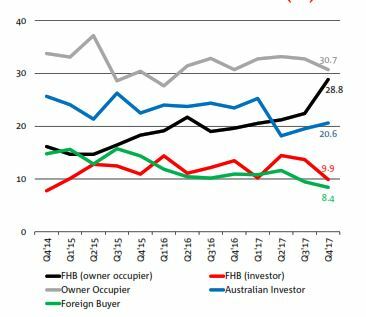 In contrast, the share of foreign buyers continued to fall in all states, except QLD (new property) and VIC (established housing), with property experts predicting further reductions over the next 12 months. NAB’s view for 2018 is largely unchanged, but the degree of moderation has been ramped up – driven by revisions to Sydney. House prices are forecast to rise 0.7% (previously 3.4%) and remain subdued in 2019 (0.8%). Apartments will under-perform, reflecting large stock additions and softer outlook for foreign demand. The average survey outlook for rental growth in the next 12 months was a little softer in Q4 (1.3% vs. 1.4% in the previous survey). But with the pace of rental growth exceeding house price growth, this suggests yields may improve. Expectations for rental growth were mixed across states. On average, property professionals expected the highest income returns in VIC (2.1% vs. 2.8% previously) and SA/NT (2.0% vs. 0.9%). The average outlook for rents in QLD (1.3%) and WA (0.0%) was unchanged, while expectations were revised down in NSW (1.0% vs. 1.5%). The average survey outlook is for rental growth to slow to 1.8% in 2 years’ time (2.1% forecast in the last survey). This mainly reflected downward revisions in expectations in all states except SA/NT. Property experts in SA/NT are predicting average rental growth of 2.7% in 2 years’ time (previously 1.5%). VIC rents are expected to grow next fastest (2.5% vs. 3.3%), followed by QLD (1.6% vs. 2.0%) and NSW (1.3% vs. 2.1%). Income growth is expected to be slowest in WA (0.9% vs. 1.2%), where broader economic conditions also remain challenging. If you would like a copy of the full 11 page report, please feel free to contact us or call us on 8004 2222.